It’s Monday! What Are You Reading? is a meme hosted by Sheila of Book Journey. This is a great way to plan out your reading week and see what others are currently reading as well… you never know where that next “must read” book will come from! It’s been a while since I posted here, and what better way to return than sharing what I’m reading to kick the week off. 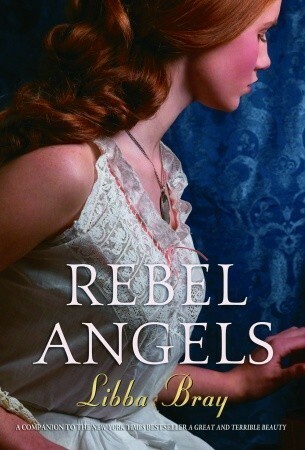 I am mid-way through Rebel Angels, the second book in Libba Bray‘s Gemma Doyle trilogy. I finished re-reading the first book, A Great and Terrible Beauty, which I have read six years ago, yet vaguely remember what it is about. Yes, I’m that terrible a reader! Anyway, Gemma and her band of friends are back, two months after the events in the exclusive Spence Academy for Girls. It’s the holidays and even if they were given time to get out of the halls of Spence, adventures, magic, and mayhem are still following them, particularly Gemma. I am enjoying the read so far, because characters present in the first volume are being fleshed out here. I hope to finish it soon. What about you, what are you reading today? For other It’s Monday! What Are You Reading? posts, visit Book Journey.